Answer. I believe in… Jesus Christ… Born of the Virgin Mary…. The third article of the Apostles’ Creed affirms that the Son of God came into the world through the two-fold miracle of the Virgin Birth; for Jesus Christ was “conceived of the Holy Ghost, born of the Virgin Mary.” Last month we examined our Lord’s conception by the Holy Ghost. The second part of the two-part miracle of the Incarnation is His birth to the Virgin Mary from whom He derived His fully human nature, body, soul (or mind), and spirit. Unlike the divine births of pagan mythology, Jesus Christ, the Son of God, was conceived and born in history, in a specific time & place. According to the promise made to King David many centuries before, Christ was made of the seed of David according to the flesh. (Romans 1:3; see also 1 Samuel 7:12; Psalm 132:11; Acts 2:30) Genealogies found the Gospels of Matthew & Luke indicate that the son of God was also the son of David as prophesied in Holy Scripture. 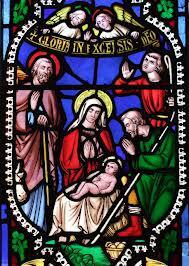 Jesus was born in Bethlehem, the city of David, while Caesar Augustus ruled the Roman Empire. (St Luke 2:1-7; St Matthew 2:4-6) Thus, the God-man Jesus’ birth is a matter of history, not mere mythology. Christ conceived by the Holy Ghost became the New Adam. (See Romans 5:12-21l 1 Corinthians 15:21-22, 45-49) Recall that the first woman, Eve, the mother of us all, rejected the promises of God and obeyed the serpent, the fallen angel Satan, instead. (Genesis 3) Yet God promised that one day the seed of the woman would come and destroy the devil and all his works. (Genesis 3:15) Unlike Eve, Mary believed with all her heart what the Lord had promised through His Angel. It was at that moment that the Word became flesh and dwelt among us. (St John 1:14) Mary gave birth to her savior and to the savior of us all; and because of her faith and obedience in submitting to God’s will & purpose, she is called blessed among women. (See St Luke 1:28, 42, 46-49; see also St Luke 11:28) And so the ancient fathers of the Church have called the Virgin Mary the New Eve; as her Son is the Second or New Adam.